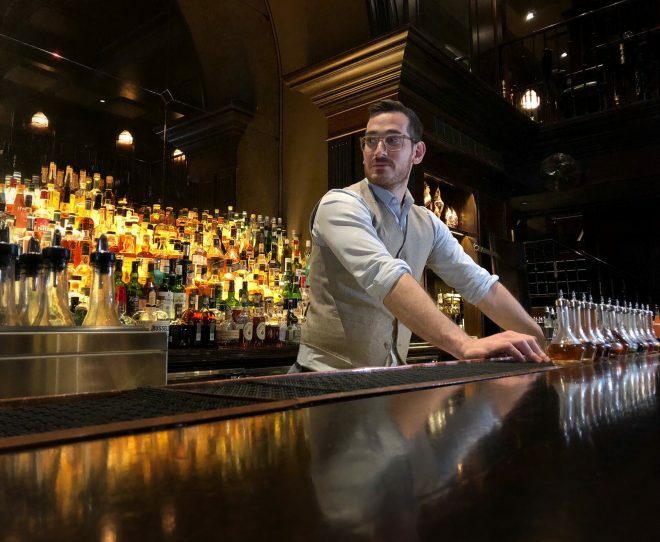 My name is Pietro Collina and I am the Bar Director of The NoMad Hotel and Eleven Madison Park Restaurant. I began in the industry when I was sixteen years old working in the kitchen at Mark’s Club in London. I decided to move to the US to study at the Culinary Insitute of America. I initially thought I wanted to be a chef, but I was also very attracted to wine and was interested in becoming a sommelier. I join Eleven Madison Park in 2009 on the floor. It was one of the most intense moments of my life because it was the beginning of the venue booming. Everyone started at 10 am to study their chosen field together and I received my certification as a sommelier. It dawned on me one day while I was working that the bartenders had way more fun than I had, so I decided I wanted to change. I stayed at Eleven Madison for four years and split my time between their bar and the NoMad. In 2014 I became the head bartender of the Nomad and now I am also in charge of our winter pop up in Aspen and one in The Hamptons for summer. I miss working behind the bar, so when I can I get behind the stick because bartending is like dancing… you have to practice. Even though we are a hotel bar, most of our customers are local, so we are always busy. There are so many great cocktail bars in the city, so we feel very honoured that most bar managers bring their parents here. To be honest it would be something very similar to The NoMad Bar. I like the fact that downstairs you can be side by side with people, it creates a special feeling similar to a pub. And upstairs it’s more intimate, like a gentleman’s club regarding all the wood and leather. I’ve done a lot of takeovers around the world, but I’d say I’d like stations similar to the ones we have here, as they allow you to work quickly and comfortably. In 2020 we open in London and that will definitely be my dream bar, it’s going to be the beauty in the group. My parents live in Rome, my wife is from London, so coming back to London means a lot for me. The London property will be in front of the Opera House and will be a boutique hotel with 70 rooms and food and beverage will be central, with four different bars in four different areas. I try to spend time with my wife, as she is not part of the industry. We walk our two french bulldogs, check out restaurants or go to parties. I just like to decompress. I like to make low ABV drinks and enjoy using dry sherry like fino or manzanilla. It gives minerality to cocktails. It’s like using salt in cooking, it adds a vital layer. I think balance more than anything. You don’t need something complex to be delicious. But it needs a storyline. For me, it comes from cookbooks. I find different flavour profiles to mix together when I am reading through cookbooks. I tend to look at a drink more like a chef than a bartender. Yoghurt is fun. When you read that on a menu, you wonder what are they doing here. But it’s not only throwing it in a tin. We prepare it with tea, and it gives acid notes and great texture. Go to the Clumsies in Athens and talk to Vasilis and Nikos. They are the best. Always fun but they work hard without showing it, they are hustlers. They are very focused on hospitality, they really make you feel comfortable. Even if the drinks are great, it’s more about the vibes. They represent Greece and their culture so well. I also love Giorgio from the Connaught Bar in London. I am American, but when I go to the bar with him and Ago I turn into the most Italian person. The Venning brothers from Three Sheets in London are amazing too. This is our final interview for 2018. Thank you to everyone we interviewed and met this year, it’s been fab. We’ll be back in January with a new interview from Rome. Wishing you all happy and safe holidays (with a few cocktails thrown in for good measure).